Yet the industry is currently undergoing a period of profound disruption with the growth of e-commerce, increasing corporate concentration, financial pressure from Wall Street investors, and emerging automation. These volatile industry dynamics have significant implications for the current and future economic security of the more than 15-million people who support their families by working in retail. To compete with intensifying market pressure, many retailers are both investing in new technology to automate work and upskilling their workforce to encourage customers to shop in stores. The retail workforce is now also adapting to new technologies that monitor their work performance, carry out their work duties, deliver training, manage their work schedules and offer additional employment. Workforce development is needed to prepare those working in the service economy for the changing nature of work. In an effort to understand the experience of the retail workforce in attaining economic stability and preparing for the work of the future, the Fair Workweek Initiative conducted a national survey of 1,100 retail workers employed across major companies and within 13 retail sub-sectors including Food and Beverage, Apparel, Home and Garden, and General Merchandise. 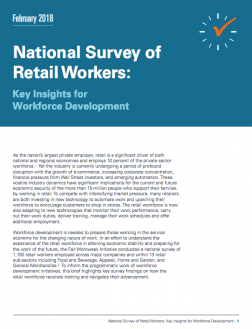 To inform the programmatic work of workforce development initiatives, this brief highlights key survey findings on how the retail workforce receives training and navigates their advancement.